I had so much fun creating this spot illustration for Canadian magazine, The Feathertale Review, which accompanied a satirical story about theories of the universe. Here's a snapshot from the magazine! FOR EDITORIAL AND ART COMMISSIONS: SEND ME A NOTE! Yep, being a travel writer has its perks. Last year, I stayed 140 consecutive nights in hotels from Lisbon to St. Moritz to the Italian Riviera. And as an illustrator, nothing beats that kind of inspiration: the over-the-top suites, the quirky experiences, the kooky, eccentric characters—love it all. This new illustration captures the spirit. And what I imagine happens when birds fly south....and write about it. Plus, it couldn't be more appropriate to kickoff another insane journey, which starts today! Hand-drawn with graphite and watercolor, and below in graphite and ink wash. Buy the art print! A little while ago, I went to sleep with a huge hankering for donuts. Totally random. Then in the middle of the night, I had this vivid vision of little folks skating on the icing. It was so bizarro, I loved it and had to bring it to life...plus, I was still craving donuts and this seemed the healthier option. Painting created with graphite and watercolor. Art print below - available in the shop! Last summer, I traveled and lived throughout Provence. Journeying by train from Lyon to Avignon to Saint-Paul de Vence, I had oodles of hours to soak up the landscape and daydream...about French cows painting the pastures. This is my newest illustration, made with graphite and watercolor. Detail below. BUY THE ART PRINT! Ah, Venice and those romantic gondola rides! But what's with the black and white, striped shirts the gondoliers always wear? Well, my imagination went a little crazy envisioning what "gondolier tryout day" would look like—bringing out characters of all stripes...like zebras, penguins, cows, skunks and Dalmatians. Hey, you gotta love those Italians! Illustration made with graphite and paper. Detail below. BUY THE ART PRINT! Did you ever have a cat that was so ridiculously full of personality that to call him a "cat" would be a full-blown insult? For my husband and I, that was our Norwegian Forest cat/person, Al. We loved every furry gray hair of that fluff ball. He said "lap" and you canceled your plans for the day. Inspired by our spazzy little guy, I made this card for my husband's recent birthday. Art prints of these illustrations are coming soon, stay tuned! 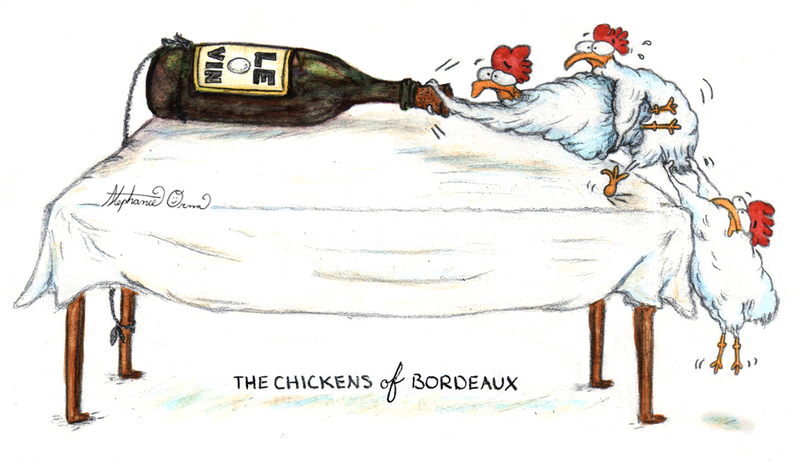 Yes, chickens can do the French can-can! This illustration was inspired by my travels this past year and living in Paris. Walking to our favorite café in the Montmartre every morning, my husband and I would pass by the tacky and touristy Moulin Rouge. I couldn't help but wonder what it must have been like in its Toulouse Lautrec heyday...and if the dancers were chickens. So I made a vintage version too. I also have secret fantasies that Moulin Poulet becomes the next great animated feature film—but I worry it might be to risqué for Pixar or Disney—these are nearly naked chickens, after all. Of course, I would argue that there's nothing vulgar about being featherless. I'll let you know how it goes. In the meantime, you can buy the art print here (hand-drawn with graphite and watercolor). New illustration! Inspired by my favorite things—travel, wine...and chickens. Hand-drawn with graphite and watercolor. Buy the art print! Hand-drawn with graphite, ink and watercolor. Buy the art print! If I were a cavewoman...I'd annoy everyone.